Deeper In 4 Grandparents & Parents, Too! 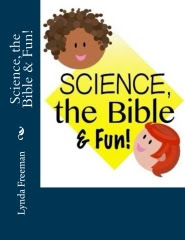 - Mini-Edition is FREE for Five Days! I believe one of the most important things we can do for the children we love - both our own children and grandchildren - is to pray for them. While we may believe this to be true, we may also feel confused about how to pray effectively for them. This is why I love praying Scripture for my adult children and my grandchildren - and is why I've released two Scripture prayer books . . . Deeper In 4 Grandparents & Parents, Too! 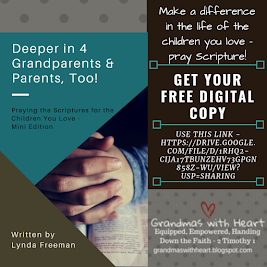 Praying the Scriptures for the Children You Love - Old Testament EditionandDeeper In 4 Grandparents & Parents, Too! Praying the Scriptures for the Children You Love - Psalms Edition. 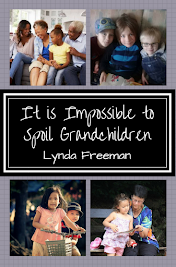 Announcing - My New Book - Deeper In 4 Grandparents & Parents, Too! Praying the Scriptures for the Children You Love - Psalms Edition! I'm very happy today to share with you my new book - Deeper In 4 Grandparents & Parents, Too! Praying the Scriptures for the Children You Love - Psalms Edition! I firmly believe one of the most significant things we can do for our grandchildren /children to pass on a heritage of faith is to be consistent and faithful in praying for them. This book will help you do exactly this by guiding you each week for a year in praying specific passages from Psalms for yourself and for your grandchildren/children. And while all of these things are excellent - and necessary things for us to do, there comes a time when we have to "act". When we have to engage our grandchildren as we are active about passing on our faith. 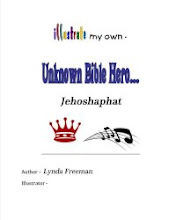 My grandsons are young - seven, four and two years old - so I focus on engaging them while they are young to build a foundation on God's Word for them to hold on to. One thing I am doing with them is called my "grandma challenge"!